The usage of color pencils renders a high degree of versatility for any individual having an artistic inclination. Working with such a medium is a mess-free way to design and shade a multitude of illustrations and drawings. 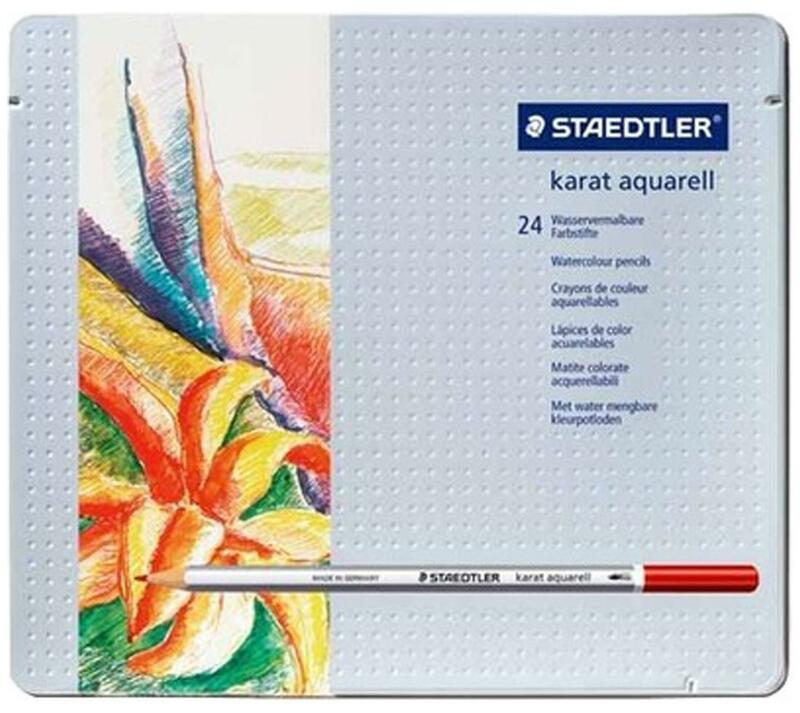 Crafted with great precision and care, the Staedtler Karat Aquarell Color Pencil set is the ultimate choice for any discerning, professional artist.Arriving in a set of 24 sturdy color pencils, artists are guaranteed a firm grip as they can embark on uninterrupted sessions of creative unleashing. The benefit of these watercolor pencils is that they are water-soluble, enabling dry or wet coloring, according to the convenience of the artist. These robust pencils also enable perfect blending techniques when you are working on large surfaces. The tips of these pencils ensure that you achieve precision when drawing bold outlines which also allows you to control the depth factor. The rich, waxy nature of the lead makes drawing, a joyful experience. # Arriving in a set of 24 sturdy color pencils, artists are guaranteed a firm grip as they can embark on uninterrupted sessions of creative unleashing. The benefit of these watercolor pencils is that they are water-soluble, enabling dry or wet coloring, according to the convenience of the artist. These robust pencils also enable perfect blending techniques when you are working on large surfaces. The tips of these pencils ensure that you achieve precision when drawing bold outlines which also allows you to control the depth factor. The rich, waxy nature of the lead makes drawing, a joyful experience.